Construction Repair NYC Licensed & Insured Proudly & Professionally Serving New York City Waterproofing Needs For Past Two Decades. Our Company Professional Crews & Hard Working Teams Will Always Be There To Help Your Waterproofing Needs. Sometime Small leak Can Make Big Difference. Doesn’t Matter Projects Is Big Or Smalls Our Past Experience Will Guide You To Right Direction To Solve The Lea-kings Problems. We Use Best Waterproofing Materiel In Market & Certified OSHA SAFETY Licensed Crews Members & Installers. Construction Repair NYC Working Through NYC Last Twenty Years Waterproofing, Basement Waterproofing, Bronx Waterproofing Contractors, Queens Waterproofing Contractor, Brooklyn Waterproofing company. We Are Well Aware Of The Weather Conditions Around The New York City. Construction Repair NYC Are Good At Making Decisions On Timely Basis. Waterproofing refers to the application of a layer or coat which prevents the ingress of water or moisture. Waterproofing can be applied on the walls as well as the ceiling of a structure. The areas where waterproofing contractors in Brooklyn NY are required are the basement of the building (which is in direct contact with soil), the humid areas like the kitchen, toilet/bathroom, and the water tank. Waterproofing would also be needed in the areas open to the elements like balconies, and the roof or terrace. If your house has a swimming pool, then it is one more area which has the need for waterproofing. Bituminous – A layer of a flexible asphalt layer is applied, which becomes completely impervious to water and moisture when it solidifies. It is also referred to as coal tar due to its black appearance. Grouting – A waterproof resin is injected for waterproofing in Long Island, NY for places where the incidence of moisture is lesser. Some structures where this type of waterproofing is used are bricks, basements, tunnels etc. Cement –Cementitious waterproofing is the most common style adopted by companies which provide waterproofing services in Bronx, NY. It is a semi-flexible or rigid type of waterproofing and is usually used in the interiors like toilets and bathrooms. 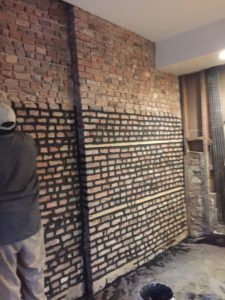 Brick Bats – This is also used by the best waterproofing company Manhattan, NY by soaking pieces of bricks and then laying them over fresh cement mortar. The thickness of these brick layers is from 70 millimeters to 150 millimeters.